Whether you’re purchasing your first garage door or looking to replace an existing one, you may be surprised at how many options you have to consider. Though all garage doors serve essentially the same function, they vary dramatically in appearance as well as in their unique strengths. Choosing a garage door material doesn’t need to be overwhelming, however. This guide can help you make the best choice for you and your home. We’ll look at the pros and cons of four common garage door material options: steel, aluminum, wood and fiberglass. Durable: Steel is an exceptionally strong and durable material, especially when it is galvanized or otherwise coated to protect it against rust. When it’s coated, it can hold up against the elements outside without warping or cracking. You can capitalize on the strength of steel by choosing a lower (thicker) gauge of steel or by selecting a garage door comprised of more than one layer of steel. Affordable: Steel is also one of the more affordable options for garage doors, though it costs more than aluminum. A variety of factors, including size, style and the particular features of your garage door, will determine the exact price you pay, but you can potentially get a steel garage door for under $1000. Low-Maintenance: Steel garage doors are also low-maintenance, especially when compared with wood. If your door is painted, you may want to repaint it periodically to maintain a fresh appearance. Otherwise, it doesn’t require much ongoing attention to maintain it. As with all garage doors, you’ll want to inspect it periodically to make sure your weatherstripping and hardware are all in good working order. Customizable: Since steel garage doors are so popular, they are available in a wide range of styles and options. This means you can choose a color and finish that complements your home’s exterior. You can even opt for steel that is texturized to mimic the appearance of wood. Beyond finish and style, you can choose a window configuration that helps you achieve the look you desire. Rust: Since steel is a metal, it’s inherently prone to rust and corrosion when exposed to the elements. However, garage door manufacturers understand how to prevent steel from rusting or corroding. Most steel is galvanized, meaning it is dipped in molten zinc, which leaves it with a protective coating. Other types of overlays and coatings can also deliver a layer of protection against the elements. Dents: Metal is susceptible to denting, too. This is especially true for thinner or more malleable metals, including aluminum. To reduce your garage door’s risk of denting if it’s impacted by your car, a baseball or any other force, opt for lower gauge steel, such as 25 or below. Protective overlays will also help fortify your steel garage door against denting. Insulation: Steel is a better insulator than wood, but it still isn’t a good insulator on its own. Insulation is essential if you want your garage to remain warmer in the winter and cooler in the summer than outdoor temperatures or if you want to block noise. Because steel isn’t a good insulator by itself, you can choose a garage door model that includes insulation between the layers of steel. Contemporary: If you’re going for a sleek, modern look, you won’t find a more fitting style than an aluminum frame garage door with large glass panels. Because they’re covered in frosted glass, these doors allow a great deal of natural light to come into the garage, which contributes to an airier, more open feel inside. At night, your garage door can glow from the inside out. Rust-Resistant: As a metal, aluminum is more resistant to corrosion and rust than steel due to its chemical makeup. This makes aluminum better equipped on its own to hold up in wet climates where rust or corrosion may otherwise be an issue. As with steel, protective coatings and paint can further protect the metal. Lightweight: Another thing that sets aluminum apart is that it’s exceptionally lightweight. It’s an excellent option for garage doors that are extra wide because it won’t put as much strain on your opener and tracks as a heavier material would. In the past, some aluminum garage doors were a little too lightweight to the point of being flimsy, but newer models are stronger. Affordable: At an even lower price tag than steel, aluminum is very affordable, making it a good option for homeowners working with a tight budget. Of course, more heavy-duty aluminum will cost more, as will more premium models. Low-Maintenance: Like steel, aluminum garage doors don’t require much routine maintenance. You could even describe them as maintenance-free, with the exception of repairing any damage that may occur from time to time. Privacy: If privacy is important to you, you may not like the idea of all that glass on your garage door, giving passersby a view of your garage’s interior. Most homeowners opt for glass panels that are frosted to allow light to shine through while obscuring the view. If you want maximum privacy, consider solid aluminum panels with no glass. Damage: Because aluminum is a weaker metal than steel, it’s prone to denting. Double-paneled aluminum doors will resist denting better than single-paneled ones. The glass panels are also susceptible to cracking or breaking if impacted with enough force, though it’s unlikely for them to do so. Insulation: Aluminum is a poor insulator, so it could cause your garage to become very cold in the winter and too hot in the summer — unless you choose a model that includes a layer of insulation between panels of aluminum. This insulation will help your aluminum garage door maintain a more stable temperature inside. Beautiful: Homeowners are typically drawn to wooden garage doors because of their timeless charm. Unlike more modern building materials, wood can fit in seamlessly with more rustic or classical architectural styles. If your garage is attached or next to your home, a wood garage door can dramatically enhance your home’s curb appeal. Customizable: Wood garage doors come in both carriage house and classic raised panel designs and can be customized in a variety of ways. Choose from different types of timber, and select a paint or stain that coordinates with the rest of your property. Other accents, like windows and decorative hardware, can also help you achieve the perfect look for you. Eco-Friendly: Since wood is a renewable resource and has a long life cycle, it’s an exceptionally eco-friendly material. That said, this doesn’t mean other types of garage door materials are harmful to the environment. You may be able to recycle metal and fiberglass when it comes time to replace your garage door. Longlasting: Wood is also a strong, durable material, as long as it’s properly maintained. Centuries-old log cabins attest to the fact that well-preserved wood can last through the ages. While your garage door likely won’t last centuries, it could last for decades. No matter how long your wood garage door lasts, one perk of wood’s strength is that it isn’t prone to denting like metal is. Cost: The main drawback of wood doors for most homeowners is the cost. Wood garage doors are a higher-end option that tends to cost more than even the priciest steel doors, but they can be a great investment. A more affordable wood option is wood composite, which can look like solid wood, though it isn’t as heavy or durable. Maintenance: Wood requires more maintenance than metal. Since wood is a porous material, it needs to be treated regularly to seal it from moisture that could cause it to rot. If your wood garage door is painted or stained, you’ll need to repaint or restain it every one or two years to maintain its appearance. Insulation: One thing metal and wood garage doors have in common is that they’re not very effective insulators. Wood offers even less insulation than steel. Like metal garage doors, wood garage doors can be outfitted with a layer of insulation, which will help your garage maintain a more mild internal temperature. Durable: Fiberglass doors are strong and can even last longer than traditional steel doors. Fiberglass is also resistant to sources of damage that can affect wood, including insects, salt and moisture. 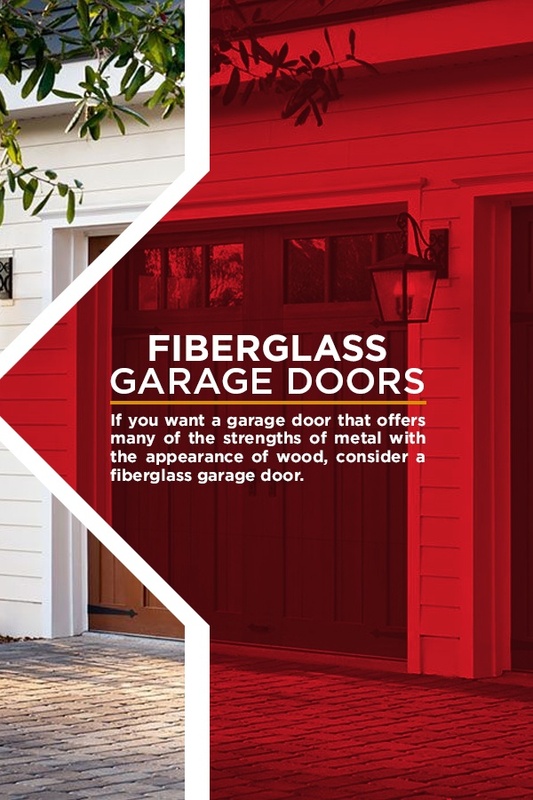 Affordable: Fiberglass garage doors are also very affordable, especially if you’re comparing them to wood doors with a similar appearance. They can even be more affordable than steel garage doors. Low-Maintenance: Since they are nonporous, fiberglass doors don’t require the ongoing maintenance that wood garage doors do. These doors aren’t typically painted, so you don’t have to worry about doing anything to maintain the color you originally chose. Lightweight: Fiberglass is one of the lightest materials you can use for a garage door. This makes fiberglass garage doors easy to manually pull up and down and also means they’re easier on your automatic opener and tracks. Customizable: One of the advantages of fiberglass is that its surface comes in a variety of styles. It can even mimic other materials, most commonly wood. This makes fiberglass doors the perfect option for some homeowners who don’t want the expense but do want the classic appearance of wood. Cracking: Though fiberglass is, overall, a very durable material, in extreme weather, such as high winds and very cold temperatures, fiberglass can become brittle, which can lead to the material cracking. Discoloration: Excessive sunlight can cause fiberglass doors to discolor over time. You may see lines or yellowing where the sun hits your door. If you don’t live in an area where your garage is in direct sunlight for much of the time, then this may not be a problem at all. Resistance to Paint: Because their surface is nonporous and also sometimes completely smooth, fiberglass garage doors don’t hold onto paint and primers well. This can be a disappointment to homeowners who want to try a new color on their garage door. Before painting a fiberglass garage door, you must prepare the surface so the paint won’t flake off. Aesthetic: The right garage door can add curb appeal to your home, making it appear more charming to visitors or potential buyers if you’re looking to place your house on the market. The key here is to choose a garage door that complements the rest of your home’s exterior. Function: Consider factors such as whether you need your garage door to be well-insulated and whether you want natural light in your garage. Also, think about the size of your garage door opening and whether you may want a more lightweight material for a larger door. Expense: As with any purchase, your budget is an important factor to consider. However, you should have the mindset that a new garage door is an investment. An upscale garage door replacement can yield an exceptionally high ROI of 98 percent. No matter which type of garage door you decide on, if you live in the greater Cincinnati area or Northern Kentucky, contact AE Door & Window. We are a major supplier of Clopay Garage Doors. Clopay garage door materials give you a wide range of options to consider, and we have the expertise to help you select the right door for your home. Our technicians can also install your garage doors and service any necessary repairs. For garage doors in Cincinnati, Ohio, or northern Kentucky, request an estimate today from AE Door & Window, or go ahead and schedule service. We are eager to help you bring the perfect combination of charm and functionality to your home at a price you can afford. Replace Your Garage Door & Entry Door At the Same Time!